I knew this day would come sooner than I thought but today I found out my 10 year class reunion is in 6 months…. I feel like at the age I am at many friends are struggling with their identity and if they are where they thought they would be at this age…. Here is a reflection of what I thought I would be vs. where I am. -Marriage. I made a VERY dumb promise to my high school boyfriend that if we weren’t married by 30 we would marry each other…. Thank goodness I am married… I dodged a bullet there… AH to be young and in love! ha! -Job. I think in many ways (as with many in my generation), we grew up during a great time but around the time of college graduation the economy sunk… I had NO idea what I wanted to do when I went to college, but it all fell into place. Thus, I am happy with what I do now but man I struggled to get here. I have also learned to find happiness in where I am volunteering and giving my time back. -Family. No kids yet but two great dogs. I want kids just hasn’t happened yet! But I can say I NEVER would have guessed the tragedies that would strike my family (who would?!) BUT I can say I knew my family was strong and now I see where that strength helped us bond together and lift each other up. I know moving forward major events will be bittersweet with out my mom but she is watching and guarding us, I know it! -Location. Had you told me I would live in Texas 10 years ago, I probably would have laughed at you. But now it is my home and my Texas family is growing. It wasn’t easy to leave my friends and it sure was hard making new ones but I have and they are loyal souls that I am glad have made their mark in my life. 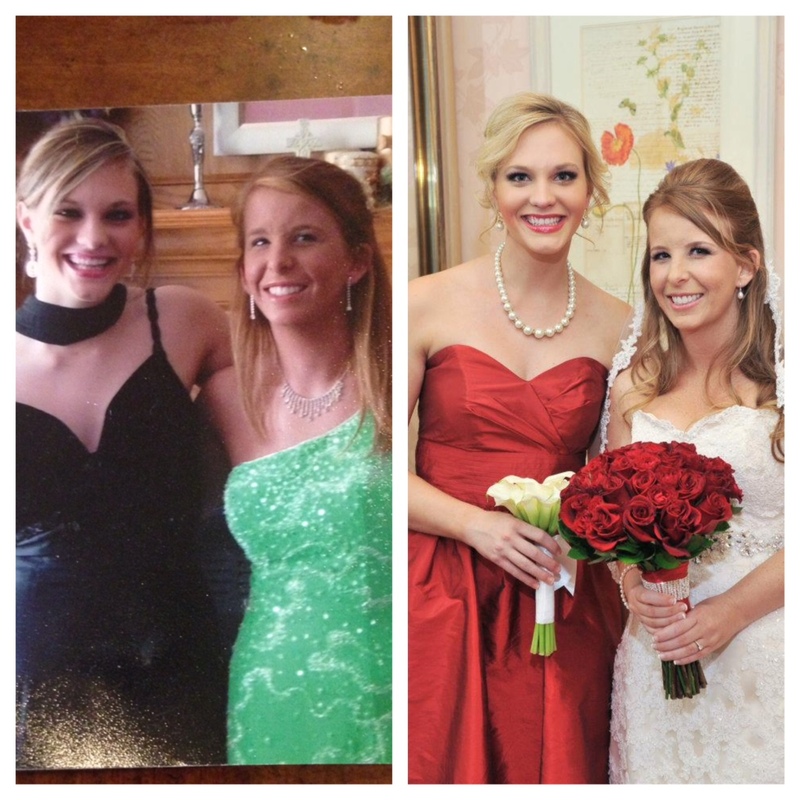 Just for some giggles here is one of my oldest friends and myself (we have know each other for almost 22 years, SHESH), side by side at my Senior Prom (Can you say, HELLO, FAKE BAKE! )Then side by side before my wedding ceremony.